Samya Abdela concentrates her practice in corporate matters, with an emphasis on private equity transactions and mergers and acquisitions. Samya also advises companies on a broad range of general corporate and corporate governance matters. She has represented strategic and financial buyers and sellers in M&A transactions spanning diverse industries and through all stages of a transaction. In addition, she also maintains an active pro bono practice, including asylum representation, and advises nonprofit organizations on board governance and conflict of interest issues. During law school, Samya served as the editor-in-chief for the University of California, Berkeley School of Law Journal of Entertainment and Sports Law, the chair of the annual Berkeley Law Sports and Society Conference and co-president of the Law Students of African Descent. Additionally, Samya was the 2L Diversity scholar at Katten in the summer of 2017. 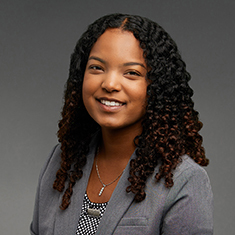 Prior to joining Katten, Samya was a 1L summer associate at an international law firm and in the spring of 2018 worked with the in-house legal team of the Pacific-12 Sports Conference. Shown below is a selection of Samya’s engagements.